Purchasing managers’ surveys and the November employment situation reports are out this week. We expect solid showing in both areas. Friday brings the final employment report before the Federal Reserve’s December meeting. Given other recent reports, we expect a solid report with monthly payrolls up ~200,000. This should provide further justification for what is now a widely expected December rate hike. We are also watching for the wage component and expect another strong rise in wages and salaries. A 4-5% increase in year-over-year incomes seems easily in the cards and should garner significant attention. The Institute for Supply Management’s Purchasing Manager’s Index (PMI) survey should also be positive. We expect to see the index at levels that confirm expansion in manufacturing and the overall economy. The bounce in U.S. manufacturing since the spring is mirrored by a manufacturing pickup overseas too. Growth is likely set to pick up in income, demand, and investment given the trends we are seeing now. The Federal Reserve Bank of Atlanta’s “GDP Now” model now sees the U.S. economy growing at a 3.6% annualized pace in the fourth quarter. As the economy continues to grow, lingering slack from the recession is reduced. The “output gap”, or the difference between the economy’s actual production and the economy’s “potential” (CBO estimate), is rapidly disappearing. Today, the economy is producing about 1.5% below potential versus 6% below when the ’07-09 recession ended. 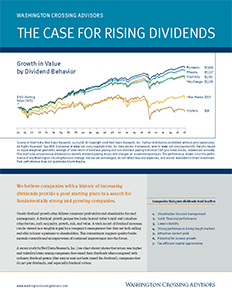 A renewed sense of positive economic momentum is helping to lift stocks and fostering risk taking. Continued progress in jobs and wages is helping to support final demand. Other indicators, including PMI’s here and abroad, also suggest a better supply side outlook for the United States. These trends, which began to take shape in late spring and early summer, are likely to get an added boost from some form of “pro-growth” policy set under the incoming Trump administration. While little detail is known about the plan, we are adding 1% to our 2017-2019 real growth outlook to account for this anticipated fiscal policy tilt (more details and revisions to follow). 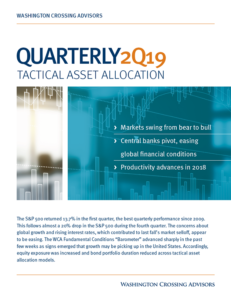 Given incoming data and above 50 reading on our WCA Fundamental Conditions Barometer, we remain overweight risk-oriented assets and underweight long-term Treasury bonds in our macro-driven tactical portfolio tilts.